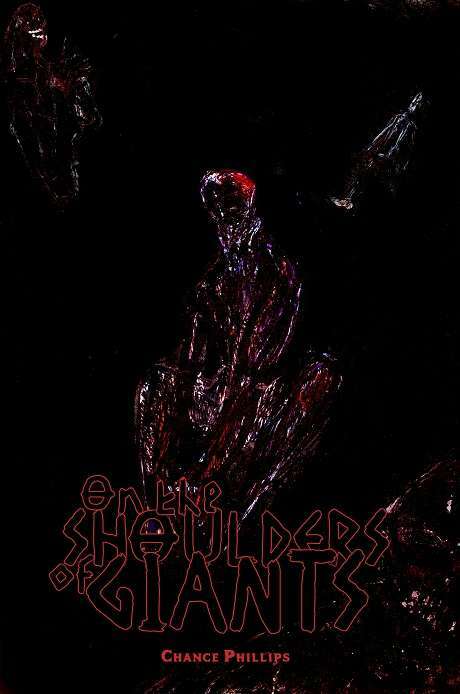 Published by Apollyon Press, LLC, following a successful Kickstarter campaign, On the Shoulders of Giants is a setting sourcebook for use with Lamentations of the Flame Princess Weird Fantasy Roleplaying and other Old School Rennaisance retroclones. It presents an intriguing setting, four new Classes, associated spell-like abilities, a short bestiary of strange beasts, a location ready for adventure, and more, all illustrated by Scrap Princess, the artist whose artwork has graced the pages of other titles for use with Lamentations of the Flame Princess Weird Fantasy Roleplaying, most notably the Ennie Award winning Veins of the Earth and Deep Carbon Observatory. The setting for On the Shoulders of Giants is not the body of one dead god, but twelve. In ages past, the twelve gods of the Greek pantheon—Zeus, Hera, Poseidon, Demeter, Athena, Apollo, Artemis, Ares, Aphrodite, Hephaestus, Hermes, and Dionysius—warred against each other over the imperfections they saw in one another, and one by one they died at the hands of their fellow gods until only Apollo lived. In anguish at what he had wrought, Apollo stabbed himself in the heart, and he too, died. Their divine caracasses did not remain inviolate however, and from their bodies were born maggots and as these maggots feed upon the godly flesh, they first formed mannish faces, before transforming into men, each with behaviours and attitudes born of their source flesh. In time these men learned to make their way on the bodies of these gods. They farm the maggots for food and crafting materials; they draw the gods’ blood from their giant veins and distil, filter, and separate into humours for use in draughts and potions; they extract bone marrow and harden it with fire to make arms and armour; they take god-flesh and smelt it into metal or grind it into a paste; and they seek out the organs of the gods for the untold riches they might hold—although the stomach is known to be home to daemons! On the Shoulders of Giants offers four Classes—the Conspirator, the Corpse Worker, the Prize Fighter, and the Witchdoctor, each of them quite simple. At each Level, the Conspirator gains Planning Points which he can use in an adventure to modify the results of the twenty-sided die, roll twice for damage and take the best result, and reduce damage taken on a point for point basis. When a Planning Point is spent, the player has to explain what he did before the start of the adventure in order to prepare for such a situation. This is a nice and simple mechanic, allowing a player to add to the narrative. The Corpse Worker extracts vital memories, the four humours, and more from the bodies of the dead gods, supplying Witchdoctors with ingredients for their experiments and more. Corpse Workers are skilled in Climbing and Architecture as well as being hardier and having good Saving Throws. Prize Fighters are bruising fighters and can withstand the Witchdoctor’s ability to graft limbs more easily than others, but they cannot take much in the way of punishment. Witchdoctors research and conduct Experiments using reagents and ingredients mined from the bodies of the gods. Some thirteen Experiments are described in On the Shoulders of Giants, for example, Bloodletting involves humours being sprinkled on an open vein to actually heal someone (though there is the chance it may inflict more damage); Pick Up the Scent requires the use a nose which will twitch in the direction of the intended quarry; and with Viscous Membrane, a phlegm-coated leather scrap can be turned into an impenetrable barrier for a few rounds. It should be made clear that Experiments are not spells, but rather vile tests and procedures using godly ingredients. By default the only available Race in On the Shoulders of Giants is the Human-like men transformed from maggots born of bodies of dead gods. It is suggested that depending on what body a maggot was born from, certain residues might carry over and influence certain attitudes and behaviours. For example, someone born of Artemis would know great precision and accuracy, but have skin possessing a silvery sheen, whilst those born of Hera are loyal to a fault, but wrathful when betrayed. Oddly, there are no bonuses or penalties provided for these, especially when it would have been easy for the author to provide them. Indeed, the Game Master can easily create them himself. For example, a man born of Hermes, who values and takes great pride in physical prowess, might gain a +1 bonus to physical actions, but a -2 reaction towards anyone who does not. 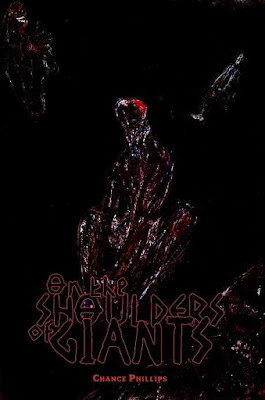 A few monsters are detailed in On the Shoulders of Giants, such as the stomach-born acidic Daemons who slide out of the noses of the gods to offer binding contracts which exchange baubles and trinkets in return for men’s souls; Flesh-eaters are men who have been transformed into mindless husks after having consumed far too much god-flesh, but who can recover if allowed to gorge on adequate food for days and days—some cults force initiates to undergo this process to prove their devotion; and Sky Squids, tentacular creatures that will convey those who ride inside them to the body of another random god. This is in addition to a set of tables for creating random monsters. In terms of specific settings, the supplement describes ‘The Gray Pools’, an adventure outline. A Gray Pool is a site where a god’s brains have seeped to the surface through his shattered skull, the liquid having a variety of results when consumed, including psychic powers. An NPC or two who possess an interest in controlling such sites are also described as are some adventure ideas. Rounding out On the Shoulders of Giants are appendices providing a bibliography, conversion of the four Classes to The Black Hack, the Maggot Farmer as an NPC Class, and a table of names. Physically, On the Shoulders of Giants is decently produced, a somewhat thin, if sturdy hardback. The writing is decent, but the artwork is fetchingly grimy and menacing. Now the idea of adventurers plundering the body of dead gods is nothing new. After all, Malhavoc Press published a supplement devoted to it for use with Dungeons & Dragons, Third Edition in 2002, called Requiem for a God. But living on the gods and mining them is an interesting idea and suggests possibilities aplenty. Unfortunately, as intriguing a setting as presented in On the Shoulders of Giants actually is, the supplement fails to do two fundamental things. First, it fails to answer some very basic questions. Who lives on the bodies of the twelve gods, what peoples, what towns, and so on? What do they do? Where are the bodies of the twelve gods located? How can outsiders get there—a possibility suggested in the text? What do adventurers—or the player characters—do on the bodies of the twelve gods? Second, it sets up some interesting facts and then utterly fails to support them. So if the Conspirator is the brains behind daring heists and organisations, then what heists and what is he stealing, and what organisations? Where does the Prize Fighter fight and what for? If some cults force feed initiates godflesh, what are these cults and what do they want? And more importantly, where is the rest of On the Shoulders of Giants with these answers? As it stands, this supplement is incomplete or unfinished. Either way, as much as a setting based on the dead bodies of the Greek gods is rife with possibilities, On the Shoulders of Giants fails to flesh out its setting, leaving the Game Master to do the development work and answer some very basic questions that the author should have done. It is a book of ideas rather than the setting it should have been.